A dependency property provides functionality that extends the functionality of a property as opposed to a property that is backed by a field. It is used to create bindable properties on objects deriving from DependencyObject, for example in controls. 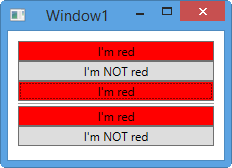 It is used all across WPF. You can use it as well to create your own bindable properties. This entry was posted in General and tagged c#, dependency-property, wpf on March 13, 2015 by BrunoLM.